The predecessor of the medieval bestiary, compiled in Late Antiquity and known as Physiologus (Φυσιολόγος), popularized an elaborate allegory in which a unicorn, trapped by a maiden (representing the Virgin Mary), stood for the Incarnation. As soon as the unicorn sees her, it lays its head on her lap and falls asleep. This became a basic emblematic tag that underlies medieval notions of the unicorn, justifying its appearance in every form of religious art. The two major interpretations of the unicorn symbol hinge on pagan and Catholic symbolism. The pagan interpretation focuses on the medieval lore of beguiled lovers, whereas some Catholic writings interpret the unicorn and its death as the Passion of Christ. The unicorn has long been identified as a symbol of Christ by Catholic writers, allowing the traditionally pagan symbolism of the unicorn to become acceptable within religious doctrine. The original myths refer to a beast with one horn that can only be tamed by a virgin maiden; subsequently, some Catholic scholars translated this into an allegory for Christ's relationship with the Virgin Mary. Interestingly enough, the collective term for a grouping of unicorns is "a blessing of unicorns". scarcely smaller than elephants. They have the hair of a buffalo and feet like an elephant's. They have a single large black horn in the middle of the forehead... They have a head like a wild boar's… They spend their time by preference wallowing in mud and slime. They are very ugly brutes to look at. They are not at all such as we describe them when we relate that they let themselves be captured by virgins, but clean contrary to our notions. It is clear that Marco Polo was describing a rhinoceros. In German, since the 16th century, Einhorn ("one-horn") has become a descriptor of the various species of rhinoceros. In popular belief, examined wittily and at length in the seventeenth century by Sir Thomas Browne in his Pseudodoxia Epidemica, unicorn horns could neutralize poisons. Therefore, people who feared poisoning sometimes drank from goblets made of "unicorn horn". Alleged aphrodisiac qualities and other purported medicinal virtues also drove up the cost of "unicorn" products such as milk, hide, and offal. Unicorns were also said to be able to determine whether or not a woman was a virgin; in some tales, they could only be mounted by virgins. "The unicorn, through its intemperance and not knowing how to control itself, for the love it bears to fair maidens forgets its ferocity and wildness; and laying aside all fear it will go up to a seated damsel and go to sleep in her lap, and thus the hunters take it." The famous late Gothic series of seven tapestry hangings, The Hunt of the Unicorn are a high point in European tapestry manufacture, combining both secular and religious themes. The tapestries now hang in the Cloisters division of the Metropolitan Museum of Art in New York City. In the series, richly dressed noblemen, accompanied by huntsmen and hounds, pursue a unicorn against mille-fleur backgrounds or settings of buildings and gardens. They bring the animal to bay with the help of a maiden who traps it with her charms, appear to kill it, and bring it back to a castle; in the last and most famous panel, "The Unicorn in Captivity," the unicorn is shown alive again and happy, chained to a pomegranate tree surrounded by a fence, in a field of flowers. Scholars conjecture that the red stains on its flanks are not blood but rather the juice from pomegranates, which were a symbol of fertility. However, the true meaning of the mysterious resurrected Unicorn in the last panel is unclear. The series was woven about 1500 in the Low Countries, probably Brussels or Liège, for an unknown patron. A set of six engravings on the same theme, treated rather differently, were engraved by the French artist Jean Duvet in the 1540s. 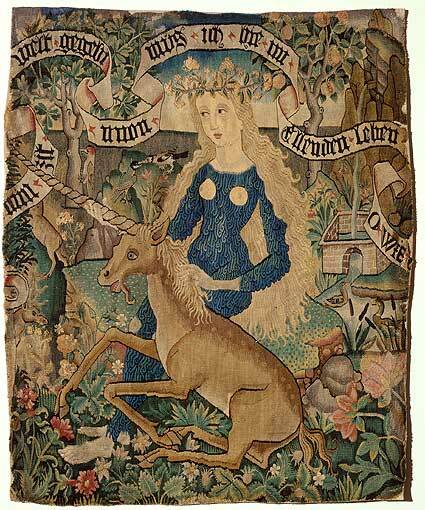 Another famous set of six tapestries of Dame à la licorne ("Lady with the unicorn") in the Musée de Cluny, Paris, were also woven in the Southern Netherlands before 1500, and show the five senses (the gateways to temptation) and finally Love ("A mon seul desir" the legend reads), with unicorns featured in each piece. Facsimiles of the unicorn tapestries are currently being woven for permanent display in Stirling Castle, Scotland, to take the place of a set recorded in the castle in the 16th century.